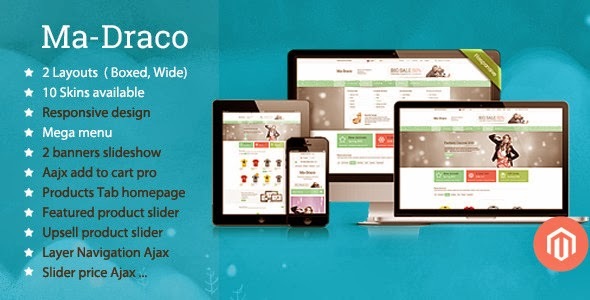 Draco Magento theme comes with a unique style, clear and easy to customize template. If you sell your products through the Internet, it’s very easy to have a professional and good-looking website to encourage your potential customers to buy in your online store. Draco magento theme is designed for fashion such as clothes, shoes, hats, footwear with large and nice slideshow, many effects. You have two choices to show slideshow and megamenu : full width slideshow and megamenu with ma_draco_wide template and not full width slideshow and megamenu with ma_draco_box template. Like a colorful design , you can choose one color you like to show in your shop : light sea green, cadet blue, cornflower blue, green, coral, manatee, medium purple, shamrock, tumbleweed, watermelon. Each detail is designed and displayed minutely and good looking. This theme uses banner sequence and banner7 to display slideshow the most beautifully and conveniently. You can choose one of 2 extensions. Item Reviewed: Draco - Responsive Magento Theme For Fashion Website 9 out of 10 based on 10 ratings. 9 user reviews.